There is little doubt that humans and dogs are naturally inclined to be best friends. But when and how did this dynamic duo first emerge? Conventional wisdom holds that agrarian man domesticated scavenger canines about 15,000 years ago. However, recent archaeological discoveries and DNA analyses show that not only is our friendship closer to 30,000 years old (possibly 40,000 years) but also that man did not master and breed wolves into companionable dogs. Rather, our relationship was built on mutual benefits and respect. 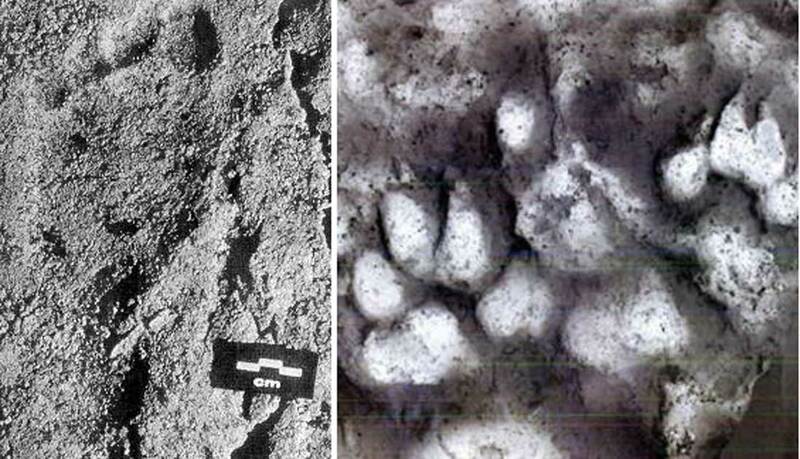 This new reality has been made strikingly clear by the discovery of a set of footprints indicating a small child walked alongside a large wolf some 26,000 years ago. The Chauvet Cave in France is renowned as the site of some of the world’s oldest paintings. Over 400 images of animals were created around 32,000 years ago. Yet it is another discovery that has gripped the imagination of canine enthusiasts. In the back of the cave, one can see the ancient footsteps of a small child walking alongside a wolf. Stretching over 150 feet (45.72 meters), the prints were made in soft clay, hardened, and were left undisturbed for thousands of years. The human prints are of a barefooted child aged eight to ten years old and standing about 4.5 feet (1.4 meters) tall. The child was walking, not running, although at one point it appears that he or she slipped a little in the soft clay. Researchers know that the child carried a torch because there is evidence of him/her stopping at one point to clean the torch, leaving behind a stain of charcoal. It is amazing to think of a Paleolithic kid exploring this ancient cave, examining the paintings and bear skulls that were placed reverently at the back of the cave. Even more amazing is that accompanying (not stalking) the child’s footprints are the paw prints of a wolf (or possibly a large dog). This timeless image of a child and dog shatters the notion that dogs were only domesticated 15,000 years ago. More importantly, the new time period radically alters the answer to how dogs became man’s best friend. The now-outdated theory claims that at the end of the last ice age, wolves came skulking around human farms to feed off the garbage. In order to gain better access, the wolf had to approach in a humble and docile fashion. This habit was passed down among wolves creating a ‘juvenilized wolf’ at which point “humans took charge of its evolution through selective breeding, choosing those with desired traits and culling those who came up short” (Derr, 2011). This theory was widely believed until recent archaeological finds and more advanced DNA testing. The new theory argues that humans and dogs evolved together. “We chose them, to be sure, but they chose us too, and our shared characteristics may well account for our seemingly unshakable mutual intimacy” (Derr, 2011). This relationship was not based on subservience but rather on a mutual respect for the different talents of each species. The most important tenet that the new theory establishes is that wolves did not first interact with settled, agrarian humans. Instead, the 30,000-year date means that they would have first encountered roaming bands of hunter-gather humans. Over time, the two would have started cooperating because of “the similar social structure and size of wolf packs and early human clans [and] the compatibility of their hunting objectives and range” (Lange, 2002). In addition, the ability of each to understand each other’s moods and intentions would have greatly increased the likelihood of positive interaction. ‘Hunter gatherers at a campsite.’ ( Newton’s Apple ) Note the wolf-dogs waiting near food. When one stops to think about it, this explanation seems a lot more credible than wolves pleading for scraps. Each side saw the benefits of teamwork. The early human would have picked up hunting strategies from the wolves and would have been greatly aided by the dogs’ keen sense of smell. Some scholars even suggest early wolf-dogs may have served as pack animals. In return, the wolves would have gained a more reliable food supply and increased protection. This was particularly important for the young pups who the adults may have been able to leave in the village while they went off on the hunt. The pups would have played with the human children and increased the fraternal bonds. It is interesting to note that, among the 400-plus animal images in Chauvet, there are no dogs or wolves. At first glance, this may seem to indicate that the humans did not know of the canine. However, experts believe the absence of wolf images is not because of human ignorance or disregard for the species. If at this point in time (32,000 years ago) the wolf-dogs were helping humans hunt, they “might have been placed in a completely different symbolic category from other animals” (Shipman, 2016). “What if dogs were put in the ‘human family’ category as an extension of the hunter, and like humans, warranted no (or very few) painted or engraved depictions?” asks Anne PikeTay of Vassar College (Shipman, 2016). White’s team has determined that Aurignacian humans did not simply wear any tooth they found. At that place and time, the most prevalent animals would have been horses, cattle, and reindeer. “Wolves [were] rare, making up less than 3 percent of the total fauna…However, nearly two thirds of the ornaments are teeth of wolves or foxes. The rest of the perforated teeth are from other rare species: bear, humans and red deer. 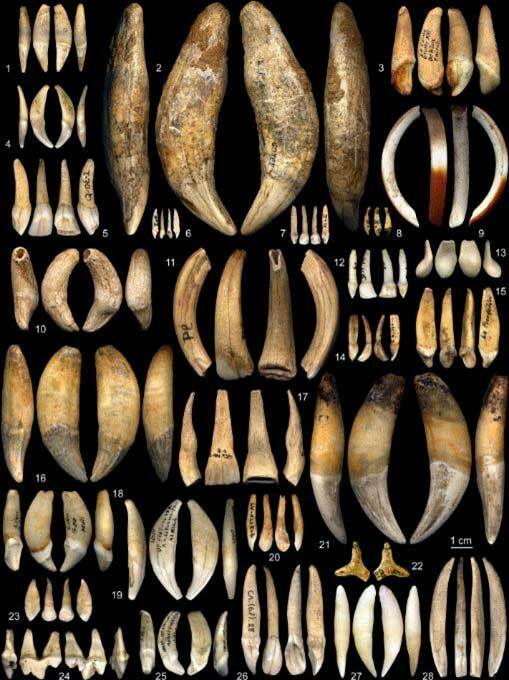 None of the teeth of the most common species were used as ornaments at Brassempouy [France]” (Shipman, 2016). The team concludes that ornaments of canine teeth could have been made by humans wishing to designate themselves as part of a clan that worked with wolves. After all, this was “a remarkable human achievement that doubtless provided a definite selective advantage to those who accomplished it successfully. They might well have had reason to brag about their accomplishment by wearing canid teeth.” (Shipman, 2016). Derr, Mark. "From the Cave to the Kennel." The Wall Street Journal . Dow Jones & Company, 29 Oct. 2011. Web. https://www.wsj.com/articles/SB10001424052970203554104577001843790269560. 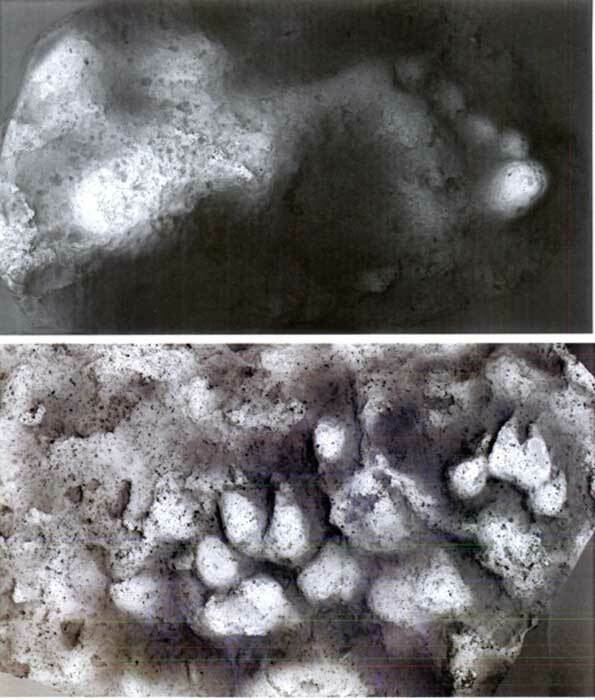 Harrington, Spencer P.M. "Human Footprints at Chauvet Cave." Archaeology Magazine Archive . Archaeology Magazine Archive, 2017. Web. http://archive.archaeology.org/9909/newsbriefs/chauvet.html. Lange, Karen E. "Wolf to Woof: The Evolution of Dogs." National Geographic Jan. 2002: n. pag. Print. Shipman, Pat. "The Woof at the Door." American Scientist . American Scientist, 2016. Web. http://www.americanscientist.org/issues/postComment.aspx?id=6793&y=2009&no=4&page=4. Maybe the kid was exploring the cave with his dog? I did same thing with my dog "Grover" as a young boy. Together we spent a lot of time just wandering and enjoying nature in the local wilderness. Plus Grover seemed to really enjoy it and used to tag along, darting in and out, when my Dad went for jogs. My Dad seemed to think that Grover was a lot more emboldened to explore other dogs' territories with a big ex-Marine around as his "pack leader" ! Bow Wow, Wow! The 45 million-year-old History of Dogs, And Us! Read more about Bow Wow, Wow! The 45 million-year-old History of Dogs, And Us!